Starting pigs off on the right hoof gives them the best opportunity to reach their full genetic potential in the nursery and beyond. A universal truth exists in swine production: Pigs must eat and drink, not only to survive, but to thrive. Times of increased stress create the biggest challenge in getting pigs to eat and drink. Weaning is a stressful time for the young pig due to myriad factors, including maternal separation, changes in environment, transportation stress, establishment of social hierarchy, abrupt diet change, vaccinations and exposure to pathogens. 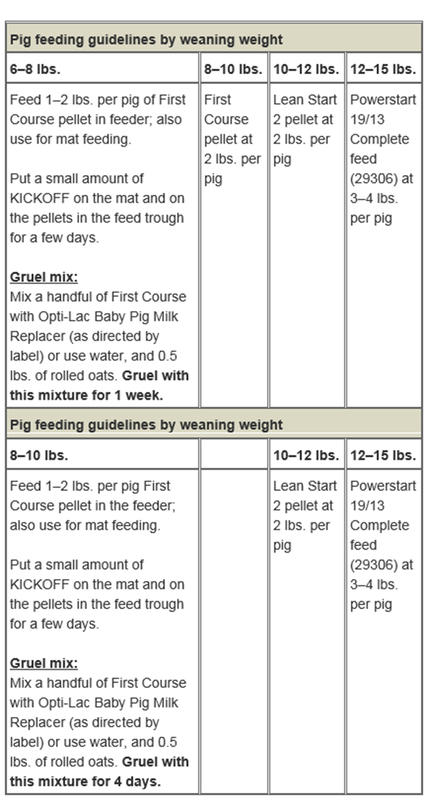 Several feeding strategies have been identified that can help improve the transition from the sow to dry feed, thereby increasing pigs’ chances of thriving. ° Troughs are easier to wash and can be stacked. • Small pigs (bottom 5 to 10%) should be sorted off on the first day pigs enter the facility, using normal stocking density. • Supply small pigs with an appropriate pre-starter. ° Feed gruel four times per day for no more than 10 days post-weaning. ° Mat feed four times per day for no more than 10 days post-weaning. • Identify sick or starve-out pigs. • The number of sick or starve-out pens may vary from group to group, but typically they use 10% of the barn space. ° Stocking density should be 50% of the normal density to reduce competition for feed and water. • Supply sick or starve-out pigs with the appropriate pre-starter. ° Gruel feed for seven days after sick/starve-out pen placement. ° Mat feed four times per day for seven to 10 days after sick/starve-out pen placement. • The poorest-performing pigs from the Day 3 to Day 5 pulls may be moved to the Day 7 to Day 10 pull pens to allow for extended gruel and mat feeding. • The biggest opportunity to boost growth and support livability/health is by increasing intakes during the first seven to 10 days post-weaning. • Walking pens and mat feeding four times per day provides the best results. • Mat feed 15 ounces by volume (0.75 pounds) for every 50 pigs per feeding (60 ounces total for one day). • A 1-pint scoop works best to provide accurate amounts and reduce wastage versus a larger scoop. • Similar to mat feeding, gruel feeding helps to boost growth and support the livability/health of small and sick/starve-out pigs that struggle in making the switch to dry feed post-weaning. 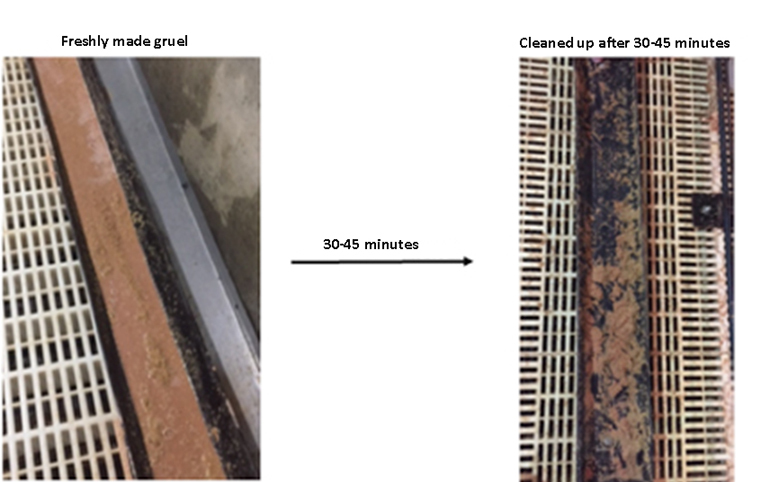 • Gruel is a mixture of dry feed, ingredients mixed with water and liquid products that is designed to increase intake. • Mix dry feed with water/liquid products in a 3:1 ratio by volume. Gruel appearance should resemble an oatmeal consistency. ° A 3:1 ratio is equivalent to 1 pound of dry feed and 0.5 gallons of water. ° Feeding at a ratio of 3:1, the trough should be licked clean within 30 to 45 minutes. ° The optimal trough space for gruel feeding is 2 inches per pig. • Gruel pans should be placed away from the sleeping area to keep pigs dry.